The Durham renaissance was a long time coming, and it didn’t happen by chance. It’s the result of a strong public-private partnership, and the willingness of the community to engage with the city’s history and embrace its diverse population. While Durham is ever-changing, its foundation was built by those bold enough to dream and brave enough to be different. There isn’t enough space to champion every person, place, and event that made Durham what it is today, but the following timeline hopefully covers a few highlights. 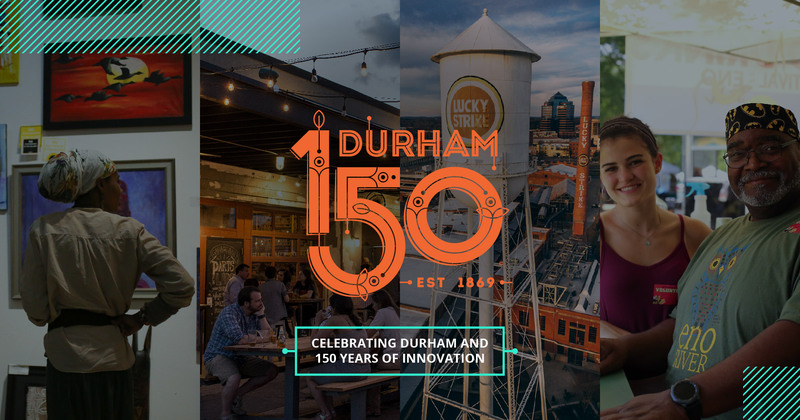 To celebrate Durham’s 150th anniversary is to rightfully honor the changemakers who shaped Durham’s unique sense of place. Durham has been the site of pivotal events long before the Bull City was put on a map and named for Dr. Bartlett Durham in the 1800s. It hasn’t been a place that’s slowed down since. Before Europeans arrived in the 1700s, two Native American tribes –the Eno and the Occaneechi, related to the Sioux –lived and farmed here. Throughout the 19th and 20th centuries, Durham has continued to evolve, progress, and thrive. The following timeline highlights a few of the people, places, and events that have helped make Durham the place it is today. You can always learn more about Durham’s roots by visiting the Museum of Durham History. The man for whom the city of Durham is named, Bartlett Leonidas Durham (1824-1859) was born to a family who had lived in Orange County for three generations. In the mid-1840s, Durham bought 100 acres near the Hillsborough-Raleigh road, between the tavern communities of Pinhook (near present-day Ninth Street) and Prattsburg (in present-day Edgemont). Durham granted a four-acre easement for a railroad track right-of-way and a depot. The station was located at present day Pettigrew and Corcoran-Blackwell streets. During the period between the Revolutionary and Civil Wars, large plantations such as Hardscrabble, Cameron, and Leigh were established. By 1860, Stagville Plantation lay at the center of one of the largest plantation holdings in the South. African slaves were brought to labor on these farms and plantations, and slave quarters became the hearth of distinctively Southern cultural traditions involving crafts, social relations, life rituals, music, and dance. There were free African Americans in the area as well, including several who fought in the Revolutionary War. General Lee had surrendered 26,000 troops at Appomattox Courthouse in Virginia, but many more southern troops were still in the field under the command of General Johnston. Purely by chance, James and Nancy Bennett’s house was where Johnston and General Sherman rendezvoused on April 17, 1865. They signed surrender papers for Southern armies in the Carolinas, Georgia, and Florida. It was the largest troop surrender, and effective end, of the American Civil War. As Durham Station’s population increased, the state General Assembly incorporated the City of Durham on April 10, 1869. Then, the city was a part of Orange County – a bill for the ratification of Durham County was later ratified in 1881. Preacher Edian Markum bought a piece of land in 1869 at the angle formed by Pettigrew and Fayetteville streets and organized a church and a school. This church became St. Joseph’s AME. This construction seems to have formed the nucleus around which the African-American community of Hayti grew. The photo is of St. Joseph’s first minister and his wife. After the ceasefire in Durham, Yankee and Rebel troops celebrated together and discovered Brightleaf tobacco – a taste that led to the success of Washington Duke and his family and spawned one of the world’s largest corporations (which included American Tobacco, Liggett & Meyers, R. J. Reynolds, and P. Lorillard). Washington Duke moved his business into Downtown Durham in April of 1874, after their business had grown too big for the family property. American Tobacco Company was founded in 1890 by J.B. Duke through a merger of several US tobacco manufacturers. The company, at one point, produced more than 90% of all cigarettes in the US and was one of the largest corporations in the world. American Tobacco Company was one of the original 12 members of the Dow Jones Industrial Average. In 1892, Trinity College moved from Randolph County to Durham. Washington Duke and Julian Carr donated money and land to facilitate the move. Following a $40 million donation by Washington Duke’s son, James Buchanan Duke, Trinity College expanded into Duke University in 1924. After the Civil War, the African-American economy progressed through a combination of vocational training, jobs, land ownership, business ownership, and community leadership. In 1898, John Merrick founded North Carolina Mutual Life Insurance Company, which today is the largest and oldest African American-owned life insurance company in the nation. With its founding in 1907, M&F Bank became one of the nation’s strongest African American-owned and -managed bank. So many other businesses joined these two in Durham’s Parrish Street neighborhood that the area became famous across the country as Black Wall Street. Dr. James E. Shepard, a Durham pharmacist and religious educator, opened the National Religious Training School and Chautauqua for the Colored Race in 1910. The school later became North Carolina Central University. This achievement – establishing a black school through black initiative – took place when race relations in the South were abysmal. Formerly the Durham Tobacconists, the Durham Bulls played their first baseball game on April 24, 1913 at Hanes Field on Trinity College campus. The team later played at El Toro Park, known today as Historic Durham Athletic Park, and went on to become one of the most famous minor league baseball teams of all time. In the heart of downtown Durham since 1926, the beautiful Beaux-arts Carolina Theatre has become one of its city’s most beloved institutions. After opening as the Durham Auditorium, the venue was renovated three years later and renamed the Carolina Theatre, a movie theater that also presented stage shows and concerts. A champion for civil and human rights, Pauli Murray grew up in Durham. She later started a campaign to join the all-white University of North Carolina, led sit-ins and other peaceful protests during the Civil Rights Movement, and became the first African American woman to become an Episcopal priest. Six African Americans demanded to be served inside the segregated Royal Ice Cream Parlor in 1957, three years prior to the famed sit-ins at The Woolworth’s in Greensboro. It marked the first peaceful demonstration to end in arrests and led to anti-segregation protests for years to come. The Durham Redevelopment Commission created in 1958 oversaw seven different projects to rebuild areas deemed blighted, build a freeway to connect the newly planned Research Triangle Park to downtown, and more – effectively dismantling the once thriving Hayti community. Urban renewal leaders did not make good on promises to the African American community, failing to provide adequate replacements for lost housing and businesses – leading to protests, unrest, and distrust in the community. Since its founding in 1959, The Research Triangle Park (RTP), has produced many game-changing innovations. Today, it is the world’s largest university-related research park. A few of the discoveries launched from RTP companies include Astroturf, the barcode, AZT, 3D Ultrasound, LED lighting, and the Periodic Table of Elements. Love and liberation have always been a part of Durham’s story. In 1981, about 300 people participated in North Carolina’s first gay and lesbian march, called “Our Day Out,” in Downtown Durham. A cult-favorite romantic comedy sports film, Bull Durham launched the careers of Kevin Costner, Tim Robbins, and Susan Sarandon – and created national attention for the Durham Bulls. It was filmed at the Durham Athletic Park and premiered at the Carolina Theatre. Sports Illustrated has ranked the film as the greatest sports movie of all time. Credits/Sources: Museum of Durham History, Lynn Richardson, Durham County Library North Carolina Collection, Open Durham, Research Triangle Park, INDY Week, Bull City 150, and Durham LGBTQ History. Photo credits: North Carolina Collection. The sesquicentennial year will be full of historical and educational events designed to celebrate the people, places, and events that have helped shape Durham. Diverse events will take place across Durham and be accessible to all. We know there are more Bull City stories than we could possibly curate. Have an idea for historical or educational programming? Or, do you have a story that you want to share? Fill out the form to let us know!